[#TAKEOVER] @roseparkroasters is my favorite coffee shop in our neighborhood. It’s luckily walking distance and we frequent it a few times a week. The baristas remember my kids' names and the kids always love sitting outside and dog watching. Their new avocado toast and menu items are truly outstanding. They started super small as roasters who delivered their coffee via bicycles (they still do) and opened their brick and mortar a few years ago. ### We’re letting a few #lbpost readers take over our Instagram for a week to showcase how they live #LongBeach. This week, @aripetronelli shows you her #LifeinLB. 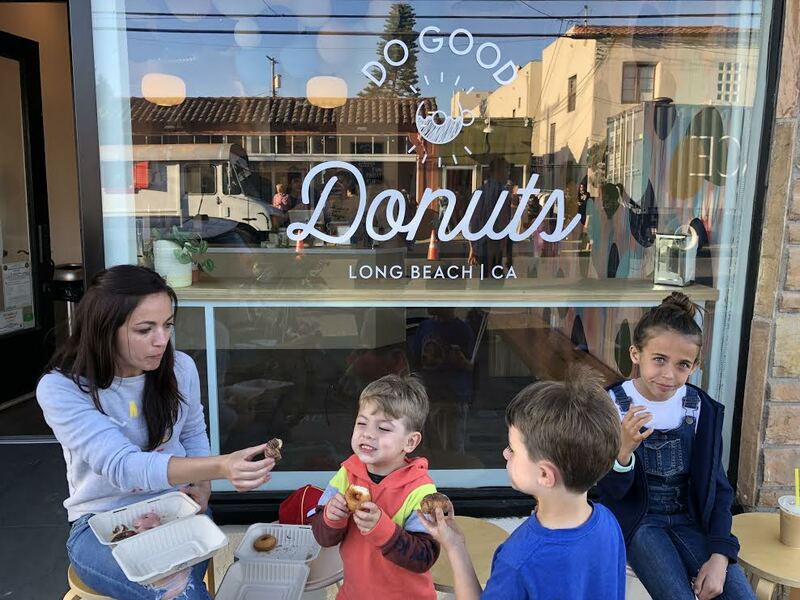 Last week, Ari Petronelli (@aripetronelli) brought @longbeachpost followers a look into what it’s like to raise three kids in her hometown. From peninsula outings to taking the trolley during Fourth Fridays, mom life seems pretty sweet. This time we dig a little deeper into just how this Long Beach native makes it look so easy. As a Long Beach native, what do you think it is about this city that has kept you here and inspired you to raise a family here? I am trying to raise my children to be creative thinkers, open minded and adventurous and I truly believe that Long Beach is the perfect place to do so. I am in awe of the creative energy and diverse community. While Long Beach is a giant city it truly has a little town feel and we love seeing familiar and friendly faces every day. It takes a village and I couldn’t imagine doing it anywhere else. [#TAKEOVER] Another one of my favorite places to visit with my kids is the @aquariumpacific which is a gem that we are lucky to have down the street. I have been taking them here since birth and we go a few times a month. It is such a familiar place but the kids discover something new with every visit. We try to avoid the high traffic times (aka school field trips) and weekends but there is beer, wine, and coffee which always helps! ### We’re letting a few #lbpost readers take over our Instagram for a week to showcase how they live #LongBeach. This week, @aripetronelli shows you her #LifeinLB. Have you ever considered moving to a different place? I briefly lived in San Francisco and I have spent months in Colorado and New York, all which are wonderful places, but I cannot imagine raising my children anywhere else. I enjoy the peace and diversity that Long Beach offers! I have taken the kids to the snow multiple times which has always been a struggle because they didn’t want to wear shoes or pants. They are definitely little beach bums and you can’t beat this weather! [#TAKEOVER] My middle kid is a huge animal lover and the Lakewood Equestrian Center has been his absolute favorite place since he was a baby. Technically it is in Lakewood but it is right across the street from the Long Beach Towne Center. The petting zoo has incredibly friendly goats that will try and sit in your lap, chickens, pigs, a donkey, tortoise, horses, and kittens for adoption. They also have pony rides for little or bigger kids which is always fun. All the animals have been rescued and for $2 admission and $2 food for the animals it is an inexpensive, perfect morning or afternoon with your littles. ### We’re letting a few #lbpost readers take over our Instagram for a week to showcase how they live #LongBeach. This week, @aripetronelli shows you her #LifeinLB. What have been some of the most difficult aspects of raising three children that have helped you grow as a person, as a mother? Children are not for the weak and having very young children as a single (or with a partner!) mom can feel very isolating and lonely, and it was scary to reach out and make new friends. I started going to things I wouldn’t normally do (like a children’s music class, Fit4moms, Moms yoga class), but I am thankful that I did because I now have an amazing support system with other Long Beach mothers and my children now have lifelong friends. [#TAKEOVER] Have you been to Fourth Friday on 4th Street yet??? I took the kids last week and now they ask to go every day! We rode the Long Beach Trolley up and down 4th Street, ate some Do Good Donuts, hung out at California Drifters, watched live music in front of some of the vintage stores and ate pizza at the food trucks. We can’t wait for the next Fourth Friday! #flashbackfriday ### Want a shot at a takeover? Is your profile public? DM us with a little information about yourself, why you love Long Beach and why you’d be a great #lbpost #TAKEOVER candidate! This week @aripetronelli showed you her #LifeinLB. And what have been some of the most rewarding/fulfilling aspects of being a mother? Being a single mom with three kids is truly exhausting and overwhelming but watching them accomplish a task, completing a project by themselves, or even just getting along with each other makes me so thankful. My father used to take my siblings and me to the peninsula when we were children, and I have the most amazing memories of us exploring and playing for hours. Now, watching my own children do the exact same thing, creating similar memories, warms my heart and means everything to me. [#TAKEOVER] Hi Long Beach! I’m Ari and I’m a Long Beach native raising my three children in this amazing city. I feel fortunate to watch my children grow up in such a diverse culture. We love to walk and explore and try to get involved as much as possible with community events and supporting local businesses. I’m excited to take over the @longbeachpost Instagram this week and share a little bit of our awesome life with you in the LBC. My absolute favorite place to take the kids is the peninsula. It's the perfect place to take your littles and for yourself to relax. I usually grab a pizza on the way and we have dinner sometimes catching a glimpse of a seal in the bay. ### We’re letting a few #lbpost readers take over our Instagram for a week to showcase how they live #LongBeach. This week, @aripetronelli shows you her #LifeinLB. When you have some time off from the kids, what are some of your favorite pastimes/activities you enjoy? How do you find time for self care with (what seems like) a pretty busy life? I don’t get too much time away from my children but if I am lucky enough to find a babysitter I will sign up for an art class or local workshop. I have learned how to indigo dye at the Family Store, now The Hangout, and looking forward to learning how to brew my own kombucha from Fine Feathers at their new location! I enjoy the local wine bars and vintage shops on 4th Street that I’m able to walk to from our home and finding a fun new (to me) spot to get a drink like at the speakeasy, The Exhibition Room.